The previous track talked about learned helplessness. As I review the Powerhouse Three mentioned at the end of track 6, think of a battered client you are treating. Where is she at regarding implementation of this primal behavior modification genre? 1. Acquiring Information About What Will Happen. Maryann stated, "When Matt came home he got angry because the rice was cold. So he flipped rice in my face. Now the first thing I do when he walks through the door is look at his face to see what kind of mood he's in." 2. Thinking About What Will Happen. Maryann stated, "But after he flipped rice in my face, I couldn't stop replaying this humiliating event in my mind over and over again. Even though no one else was there to see it, I knew it happened!" 3. New Behavior Towards What Happened. Maryann stated, "I started keeping a small notebook of the amount of time it takes to microwave each food so they would be the right temperature when Matt got home." Maryann felt helpless to control Matt's tantrums. As you are aware, once a battered woman believes that she cannot control what happens, it is hard for her to believe that she can ever influence the battering. A failure expectancy is created. This failure expectation becomes fertile soil for the growth of the idea that she must not attempt to free herself from the abuse. 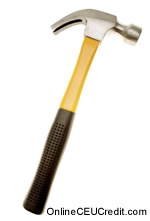 After Maryann had enough one day, she stated, "I picked up a hammer in self defense. Matt got nuts when he saw the hammer. I ended up losing 2 teeth, had a broken arm, and 3 broken ribs." Maryann thought that simply picking up the hammer was success. But the resulting beating only reinforced her failure expectancy. How do you change your Maryann's Failure Expectancy? As you know, failure expectancy is at the core of the psyche as to why women stay. Building a battered woman's self-esteem and confidence is essential in changing her Failure Expectancy. With Maryann I felt she might benefit by being taught to understand what success is, to raise her motivation and aspiration levels, and to be able to initiate new and effective responses to control her life. As you are know, battered women have a hard time being aware of and giving credit to their own feelings. To better help Maryann understand her feelings of helplessness, I used the "symptom discovery" method. Here's how "symptom discovery" works. I explained to Maryann that it is helpful to look for physical signs as indicators of her feelings. As the abuse continued, a clear pattern of symptoms and feelings emerged. First, I asked Maryann to list three physical signs of her specific feelings. Behavior 1: A constant state of being tired. When Maryann complained of always feeling tired, it often pointed to feelings of sadness or depression. Maryann stated, "After I talk or think about the beatings I have gotten from Matt, oftentimes, I immediately feel like I really need to take a nap." Behavior 2: Snapping at the children for no apparent reason. Do you agree that when battered women punish their children without reason, this over-punishing may often show that they feel underappreciated. It can also point to resentment at the good times of others, feeling resentful as she sees her children playing happily in the corner. Behavior 3: Excessive or restrained eating. Battered women often exhibit the symptom of depression by compensating for loneliness or lack of affection with extreme eating patterns. Maryann stated, "When I begin to feel alone, I will eat anything sweet that I can find in the house." Through the "symptom discovery" method, Maryann was able to better understand her own feelings and why these feelings emerged. This track covers the Powerhouse Three that occur once learned helplessness is firmly entrenched, and the intervention of Symptom Discovery. Do you consider this information important enough to replay track 7 either now or later? If you plan to play track 7 later, what do you think about writing yourself a note in your planner? In the next track we will look at six Building Blocks in the battered woman's Pyramid of Self-Hate. What are the Power House Three of learned helplessness that results in Failure Expectancy? To select and enter your answer go to CEU Answer Booklet.